Modelling N2 fixation related to Trichodesmium sp. Modelling N2 fixation related to Trichodesmium sp. 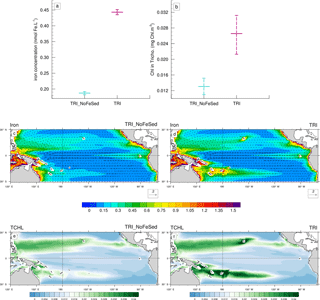 : driving processes and impacts on primary production in the tropical Pacific Ocean Modelling N2 fixation related to Trichodesmium sp. Cyril Dutheil et al. Dinitrogen fixation is now recognized as one of the major sources of bio-available nitrogen in the ocean. Thus, N2 fixation sustains a significant part of the global primary production by supplying the most common limiting nutrient for phytoplankton growth. The “Oligotrophy to UlTra-oligotrophy PACific Experiment” (OUTPACE) improved the data coverage of the western tropical South Pacific, an area recently recognized as a hotspot of N2 fixation. This new development leads us to develop and test an explicit N2 fixation formulation based on the Trichodesmium physiology (the most studied nitrogen fixer) within a 3-D coupled dynamical–biogeochemical model (ROMS-PISCES). We performed a climatological numerical simulation that is able to reproduce the main physical (e.g. sea surface temperature) and biogeochemical patterns (nutrient and chlorophyll concentrations, as well as N2 fixation) in the tropical Pacific. This simulation displayed a Trichodesmium regional distribution that extends from 150∘ E to 120∘ W in the south tropical Pacific, and from 120∘ E to 140∘ W in the north tropical Pacific. The local simulated maximuma were found around islands (Hawaii, Fiji, Samoa, New Caledonia, Vanuatu). We assessed that 15 % of the total primary production may be due to Trichodesmium in the low-nutrient low-chlorophyll regions (LNLC) of the tropical Pacific. Comparison between our explicit and the often used (in biogeochemical models) implicit parameterization of N2 fixation showed that the latter leads to an underestimation of N2 fixation rates by about 25 % in LNLC regions. Finally, we established that iron fluxes from island sediments control the spatial distribution of Trichodesmium biomasses in the western tropical South Pacific. Note, this last result does not take into account the iron supply from rivers and hydrothermal sources, which may well be of importance in a region known for its strong precipitation rates and volcanic activity. Dutheil, C., Aumont, O., Gorguès, T., Lorrain, A., Bonnet, S., Rodier, M., Dupouy, C., Shiozaki, T., and Menkes, C.: Modelling N2 fixation related to Trichodesmium sp. : driving processes and impacts on primary production in the tropical Pacific Ocean, Biogeosciences, 15, 4333-4352, https://doi.org/10.5194/bg-15-4333-2018, 2018. Nitrogen is known to be the most common limiting nutrient for phytoplankton growth in the modern world ocean (Moore et al., 2013), especially in the low-nutrient low-chlorophyll (LNLC) ecosystems (Arrigo, 2005; Gruber, 2005). Characterizing the processes governing nitrogen sources and sinks to and from the ocean is therefore central to understanding oceanic production, organic matter export, and food-web structure. Atmospheric dinitrogen (N2) dissolved in seawater is by far the dominant form of N present in the ocean, i.e. the N2 : NO3- ratio typically exceeds 100 in surface waters. However, most phytoplankton species cannot assimilate N2, and only grow using reactive forms of nitrogen such as nitrate, ammonium, and dissolved organic compounds. Some planktonic prokaryotic microorganisms, called “diazotrophs”, use an enzyme, the nitrogenase, to fix N2 and convert it into ammonia (NH3) and ultimately ammonium (NH4+). At the global scale, they provide the major external source of reactive nitrogen to the ocean (Gruber, 2008), and support up to 50 % of new production in tropical and subtropical (LNLC) regions (Bonnet et al., 2009; Capone, 1997; Deutsch et al., 2007; Karl et al., 1997; Moutin et al., 2008; Raimbault and Garcia, 2008). These organisms are physiologically and taxonomically diverse including cyanobacteria, bacteria, and archaea (Zehr and Bombar, 2015; Delmont et al., 2018). Autotrophic diazotrophs have been far more intensively studied than heterotrophic diazotrophs, whose contribution to global N2 fixation remains unclear (Turk-Kubo et al., 2014; Bombar et al., 2016; Moisander et al., 2017). Autotrophic diazotrophs have been characterized both in the field and through laboratory experiments and their physiology is consequently better known (Bergman et al., 2013; Küpper et al., 2008; Mulholland and Capone, 2001, 2000; Ohki et al., 1992; Ramamurthy and Krishnamurthy, 1967; Rubin et al., 2011). Cyanobacterial (autotrophic) diazotrophs are composed of three main groups: (1) the filamentous diazotrophs including the colonial, non-heterocyst-forming Trichodesmium, (2) the heterocyst-forming symbionts associated with diatoms (diatom–diazotroph associations; DDAs), and (3) the unicellular cyanobacterial diazotrophs (UCYN, phylogeneticaly divided into three groups: UCYN-A, -B, and -C). It has been established that autotrophic diazotroph growth rates are typically 1 order of magnitude lower than those of non-diazotrophs (Breitbarth et al., 2008; Falcón et al., 2005; Goebel et al., 2008; LaRoche and Breitbarth, 2005). This can be related to the high energetic demand (Postgate, 1982) required to convert N2 to NH3 as compared to that necessary to assimilate nitrate or ammonia. This low growth rate (compared to other phytoplankton species) mainly constrains their ecological niches to nitrate-poor regions, where they can be competitive. Moreover, their geographical distribution is constrained by nutrient availability in the photic layer (mainly iron and phosphate; Berman-Frank, 2001; Bonnet et al., 2009; Mills et al., 2004; Moutin et al., 2005, 2008; Rubin et al., 2011; Rueter, 1988) and temperature (Staal et al., 2003). Trichodesmium sp. are present only in water where the temperature is above 20 ∘C (Capone, 1997; LaRoche and Breitbarth, 2005; Montoya et al., 2004), while some UCYN can be found in colder and deeper waters (Bonnet et al., 2015; Church et al., 2005; Moisander et al., 2010). The spatial distribution and rates of N2 fixation have been inferred at the global scale using several tools. Deutsch et al. (2007) have introduced the tracer P* which represents the excess of P relative to the standard N quota. A decrease in this tracer is then interpreted as N2 fixation, since N2 fixation extracts PO4 alone. More recently, Luo et al. (2014) developed a multiple linear regression that relates N2 fixation from the MAREDAT database (Luo et al., 2012) to environmental conditions (nutrients; sea surface temperature, SST; irradiance; mixed layer depth (MLD), etc.) in order to build a statistical model for global N2 fixation distribution. Numerical models have also been used as they allow us to overcome the scarcity of observations that may limit the implementation of the two previous approaches (Aumont et al., 2015; Bissett et al., 1999; Dutkiewicz et al., 2012; Krishnamurthy et al., 2009; Monteiro et al., 2011; Moore et al., 2006, 2013; Tagliabue et al., 2008). They can notably be used to investigate the spatial and temporal variability in dinitrogen fixation and to study its controlling environmental factors. In these models, N2 fixation has been implemented in various ways. Some models use implicit parameterizations (Bissett et al., 1999; Maier-Reimer et al., 2005; Assmann et al., 2010; Aumont et al., 2015) to derive N2 fixation from environmental conditions (mainly nitrate, phosphate, and iron concentrations; temperature; and light) without explicitly simulating any nitrogen fixing organisms. Alternatively, other models rely on the explicit descriptions of diazotrophs (Moore et al., 2004; Dunne et al., 2013) that have mainly been developed from the knowledge derived from laboratory experiments focused on Trichodesmium sp. (Fennel et al., 2001; Hood et al., 2001; Moore et al., 2001). Noticeably, several modelling studies have been especially focused on the role of iron in controlling the distribution of diazotrophs and N2 fixation (Krishnamurthy et al., 2009; Moore et al., 2004, 2006; Tagliabue et al., 2008). Indeed, a realistic representation of marine iron concentrations has been stressed as a key factor to adequately simulate the habitat of diazotrophs (Monteiro et al., 2011; Dutkiewicz et al., 2012). Moreover, among the full set of studies focusing on the spatial distribution of N2 fixation, some studies (Berthelot et al., 2017; Bonnet et al., 2009, 2015; Garcia et al., 2007; Shiozaki et al., 2014) based on oceanographic campaigns have reported high N2 fixation rates in the western tropical South Pacific (WTSP), which has been recently identified as a globally important hotspot of N2 fixation with rates >600 µmol N m−2 d−1 (Bonnet et al., 2017). Very high abundances of Trichodesmium have been historically reported in this region (Dupouy et al., 2000, 2011; Moisander et al., 2008; Neveux et al., 2006; Shiozaki et al., 2014; Stenegren et al., 2018) and have recently been identified as the major contributor to N2 fixation in this region (Berthelot et al., 2017; Bonnet et al., 2018). However, the reasons for such an ecological success of diazotrophs in this region are still poorly understood. In this study, we aim at bringing new insights into this known, but poorly understood, “N2 fixation hotspot”. This study aims to understand the spatial and temporal distribution (i.e. seasonal variability) of Trichodesmium and to evaluate the potential impact of Trichodesmium fixers on the biogeochemical conditions of the WTSP. We will specifically address the following overarching questions: (i) what are the mechanisms that structure the Trichodesmium distribution in the WTSP, particularly around the southwest Pacific islands, and (ii) what is the biogeochemical impact of N2 fixation in this region? Note, this study also takes advantage of the sampling done during the “Oligotrophy to UlTra-oligotrophy PACific Experiment” (OUTPACE), which nicely complements the data coverage in the southwest Pacific, and allows a better characterization of the processes responsible for the spatial and seasonal variability in N2 fixation. To fulfill our objectives, we have implemented an explicit representation of the nitrogen fixers, based on the Trichodesmium physiology, in a biogeochemical model. The first section of this study describes the experimental design and the observations used in our study, while the second part of the paper provides a validation of our reference simulation with an analysis of the Trichodesmium compartment and its impacts on the biogeochemical conditions of the tropical Pacific. In the discussion, the impact of iron from island sediment on dinitrogen fixation is considered as well as the added value of an explicit dinitrogen fixer compartment rather than a simpler implicit representation of N2 fixation. Finally, implications for and limits of our modelling exercise are detailed in the conclusion. In this study, we used a coupled dynamical–biogeochemical framework based on the regional ocean dynamical model ROMS (Regional Oceanic Modeling System, (Shchepetkin and McWilliams, 2005) and a new version of biogeochemical model PISCES (Pelagic Interactions Scheme for Carbon and Ecosystem Studies). 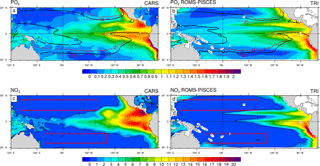 The ocean model configuration is based on the ROMS-AGRIF (Penven et al., 2006) computer code and covers the tropical Pacific region (33∘ S–33∘ N, 110∘ E–90∘ W). It has 41 terrain-following vertical levels with 2–5 m vertical resolution in the top 50 m of the water column, then 10–20 m resolution in the thermocline and 200–1000 m resolution in the deep ocean. The horizontal resolution is 1∘. The turbulent vertical mixing parameterization is based on the non-local K profile parameterization (KPP) of Large et al. (1994). Open boundary conditions are treated using a mixed active/passive scheme (Marchesiello et al., 2001). This scheme is used to force our regional configuration with monthly climatological large-scale boundary conditions from a 0.5∘ ORCA global ocean simulation (details available in Kessler and Gourdeau, 2007), while allowing anomalies to radiate out of the domain. The use of similar ROMS configurations (e.g. vertical resolution, mixed active/passive scheme, turbulent vertical mixing parameterization) in the WTSP is largely validated through studies demonstrating skills in simulating both the surface (Jullien et al., 2012, 2014; Marchesiello et al., 2010) and subsurface ocean circulation (Couvelard et al., 2008). To compute the momentum and fresh water and/or heat fluxes, we also use a climatological forcing strategy. Indeed, documenting the interannual to decadal variability is beyond the scope of our study, which justifies using climatological forcing fields. A monthly climatology of the momentum forcing is computed from the 1993–2013 period of the ERS1-2 scatterometer stress (http://cersat.ifremer.fr/oceanography-from-space/our-domains-of-research/air-sea-interaction/ers-ami-wind, last access: 12 July 2018). Indeed, the ERS-derived forcing has been shown to produce adequate simulations of the Pacific Ocean dynamics (e.g. Cravatte et al., 2007). A monthly climatology at 0.5∘ resolution computed from the Comprehensive Ocean–Atmosphere Data Set (COADS; Da Silva et al., 1994) is used for heat and fresh water forcing. In our set-up, ROMS also forces on line a biogeochemical model using a WENO5 advection scheme (i.e. five order weighted essentially non-oscillatory scheme; Shchepetkin and McWilliams, 1998). After a 1-year spin-up, we stored 1-day averaged outputs for analysis. In this study, we use a quota version of the standard PISCES model (Aumont and Bopp, 2006; Aumont et al., 2015), which simulates the marine biological productivity and the biogeochemical cycles of carbon and the main nutrients (P, N, Si, Fe). This modified model, called PISCES-QUOTA, is extensively described in Kwiatkowski et al. (2018). Our version is essentially identical to Kwiatkowski's version that included an added picophytoplankton group, except that this latter group has been removed and replaced by a Trichodesmium compartment. Here we only highlight the main characteristics of the model and the specifics of our model version. Our version of PISCES-QUOTA has 39 prognostic compartments. As in the standard PISCES version, phytoplankton growth is limited by the availability of five nutrients: nitrate as well as ammonium, phosphate, silicate, and iron. Five living compartments are represented: three phytoplankton groups corresponding to nanophytoplankton, diatoms, and Trichodesmium and two zooplankton size classes that are microzooplankton and mesozooplankton. The elemental composition of phytoplankton and non-living organic matter is variable and is prognostically predicted by the model. On the other hand, zooplankton are assumed to be strictly homeostatic, i.e. their stoichiometry is kept constant (e.g. Meunier et al., 2014; Sterner and Elser, 2002). Nutrient uptake and assimilation as well as limitation of growth rate are modelled according to the chain model of Pahlow and Oschlies (2009). The P quota limits N assimilation which in turns limits phytoplankton growth. The phosphorus to nitrogen ratios of phytoplankton are described based on the potential allocation between P-rich biosynthesis machinery, N-rich light harvesting apparatus, a nutrient uptake component, the carbon stores, and the remainder (Daines et al., 2014; Klausmeier et al., 2004). This allocation depends on the cell size and on the environmental conditions. Nutrients are delivered to the ocean through dust deposition, river runoff, and mobilization from the sediment. The atmospheric deposition of iron is derived from a climatological dust simulation (Tegen and Fung, 1995). The iron from sediment is recognized as a significant source (Johnson et al., 1999; Moore et al., 2004). This iron source is indeed parameterized in PISCES as, basically, a time-constant flux of dissolved iron (2 µmol m−2 d−1) applied over the whole sediment surface and modulated depending only on depth. A detailed description of this sedimentary source is presented in Aumont et al. (2015). The initial conditions and biogeochemical fluxes (iron, phosphorus, nitrate, etc.) at the boundaries of our domain are extracted from the World Ocean Atlas 2009 (https://www.nodc.noaa.gov/OC5/WOA09/woa09data.html, last access: 12 July 2018). In this equation, TriC is the carbon Trichodesmium biomass, and the seven terms on the right-hand side represent, respectively, growth, biosynthesis costs based on nitrate and ammonium, mortality, aggregation, and grazing by micro- and mesozooplankton. Table 1Models parameters for Trichodesmium (Tricho.) and nanophytoplakton (Nano.). where μFixN2 denotes growth due to dinitrogen fixation, μNO3Tri and μNH4Tri represent growth sustained by NO3- and NH4+ uptake, respectively. Moreover, a fraction of fixed nitrogen is released back to seawater, mainly as ammonia and dissolved organic nitrogen, by the simulated Trichodesmium compartment. Berthelot et al. (2015a) estimated this fraction to be less than 10 % when considering all diazotrophs. We set this fraction at 5 % of the total amount of fixed nitrogen. For the other nutrients (i.e. iron and phosphorus), the same fraction is also released. Dinitrogen fixation is limited by the availability of phosphate, iron, and light and is modulated by temperature. Loss processes are natural mortality and grazing by zooplankton. Natural mortality is considered to be similar to the other modelled phytoplankton species. Grazing on Trichodesmium is rarely described, but it is admitted that Trichodesmium represents a poor source of food for zooplankton (O'Neil and Romane, 1992) especially because they contain toxins (Hawser et al., 1992). On the other hand, many species of copepods have been shown to be able to graze on Trichodesmium despite the strong concentrations of toxins (O'Neil and Romane, 1992). For these reasons we applied two different coefficients for the grazing preference by mesozooplankton and microzooplankton (Table 1). For microzooplankton, grazing preference is halved to account for Trichodesmium toxicity, and for mesozooplankton the grazing preference is similar to that of the other phytoplankton species. The complete set of equations of Trichodesmium is detailed in Appendix A. Table 1 presents the parameters that differ between nanophytoplankton and Trichodesmium. This set-up reproduces dinitrogen fixation through an explicit representation of the Trichodesmium biomass (to be compared with the often used implicit parameterizations (Assmann et al., 2010; Aumont et al., 2015; Dunne et al., 2013; Maier-Reimer et al., 2005; Zahariev et al., 2008) that directly link environmental parameters to nitrogen fixation without requiring the Trichodesmium biomass to be simulated). Below the set of experiments that have been performed in this study is summarized (Table 2). All climatological simulations have been run for 20 years from the same restart and only the last 19 years are considered in our diagnostics. We chose the above-described simulation explicitly modelling the Trichodesmium to be our reference experiment (hereafter referred to as “TRI”). In a second experiment called “TRI_NoFeSed”, the model set-up is identical to the reference experiment, except that iron input from the sediments is turned off between 156∘ E and 120∘ W. In a third experiment “TRI_imp”, the explicit dinitrogen fixation module is replaced by the implicit parameterization described in Aumont et al. (2015), where fixation depends directly on water temperature, nitrogen, phosphorus, and iron concentrations and light (no nitrogen fixers are simulated). Finally, a fourth experiment “Wo_N2” corresponds to a model set-up in which no explicit nor implicit description of dinitrogen fixation is activated. Table 2List and description of the different experiments. Comparison between TRI and TRI_NoFeSed experiments enables us to estimate the impact of iron input from island sediments on the dinitrogen fixation, while the impact of dinitrogen fixation on the biogeochemical conditions in the Pacific Ocean can be investigated by comparing TRI and Wo_N2. Finally, the TRI and TRI_imp experiments are used to evaluate the added value of an explicit description of dinitrogen fixation relative to an implicit inexpensive parameterization. Figure 1Annual mean concentrations in µmol L−1: (a) PO4 data from CARS (b) PO4 simulated by the ROMS-PISCES model (c) NO3 data from CARS (d) NO3 simulated by the ROMS-PISCES model. On panels (a) and (b), the black contours show the annual mean patterns of the temperature preferendum from observations (a) and the model (b). The red contours display the 25 ∘C isoline in austral winter (plain) and in austral summer (dash). On panels (c) and (d) the red boxes represent the LNLC regions (defined as region where [NO3-]<1 µmol L−1 and [Chl]<0.1 mg Chl m−3). Several different databases have been used to evaluate the model skills. For nitrate and phosphate, the 0.5∘ global CSIRO Atlas of Regional Seas (CARS; http://www.marine.csiro.au/~dunn/cars2009/, last access: 12 July 2018) has been used. Iron has been evaluated with the global database from Tagliabue et al. (2012) complemented with the dissolved iron data from the OUTPACE cruise (Guieu et al., 2018). This database is a compilation of 13 125 dissolved iron observations covering the global ocean and encompassing the period 1978–2008. The global MARine Ecosytem DATa (MAREDAT; https://doi.pangaea.de/10.1594/PANGAEA.793246) database of N2 fixation has been expanded with data from recent cruises performed in the WTSP: MOORSPICE (Berthelot et al., 2017), DIAPALIS (Garcia et al., 2007), NECTALIS (http://www.spc.int/oceanfish/en/ofpsection/ema/biological-research/nectalis, last access: 12 July 2018), PANDORA (Bonnet et al., 2015), OUTPACE (Bonnet et al., 2018), and Mirai (Shiozaki et al., 2014). This database contains 3079 data points at the global ocean scale, of which ∼ 1300 are located in our simulated region (Luo et al., 2012). Finally, we have used surface chlorophyll concentrations from the GLOBCOLOUR project (http://hermes.acri.fr, last access: 12 July 2018) which spans the 1998–2013 time period. In this subsection, we aim at validating our reference simulation “TRI” with the data previously presented. In the Pacific, phosphate and nitrate concentrations show maxima in the upwelling regions, i.e. along the western American coast, and in the equatorial upwelling (Fig. 1a, c), and minima in the subtropical gyres. First, phosphate patterns show modelled values and structures in qualitatively good agreement with observations, despite an underestimation in the areas of high concentrations as within the Costa Rica dome and along the Equator. In contrast, the nitrate structure shows larger biases. We observe concentrations higher than 1 µmol L−1 all along the Equator in CARS, while the model nitrate concentrations are lower than this value west of 170∘ W. More generally the model tends to underestimate nitrate concentrations. Figure 2(a) Box plots of the 0–150 m averaged Iron (nmol Fe L−1) data (blue) and the equivalent for the model (red) co-localized with the observations in space and time. The coloured box represents the 25–75 % quartile of the distribution, the whiskers the 10–90 % percentile distribution. The line inside the coloured box is the median. (b, c) Iron concentrations (nmol Fe L−1) as observed (b) and as simulated by the model (c). Iron concentrations have been averaged over the top 150 m of the ocean. Model values have been sampled at the same location, the same month, and the same depth as the data. The regions most favourable for Trichodesmium can be defined by temperatures within 25–29 ∘C (Breitbarth et al., 2007). The model reproduces relatively well the spatial distribution of this temperature preferendum. This distribution exhibits a significant seasonal variability, mainly as a result of the variability of the 25 ∘C isotherm. The latter moves by ∼ 7∘ latitudinally between summer and winter in the WTSP, and by ∼ 15∘ in the western tropical North Pacific (WTNP; Fig. 1a). This displacement is well reproduced in the TRI simulation (Fig. 1b). By contrast, along the Equator the mean position of the 25 ∘C isotherm is shifted eastward in the TRI simulation (120∘ W) compared to the observations (125∘ W; Fig. 1a vs. b), but its seasonal displacements are well reproduced except in the southeastern Pacific. Overall, this temporal variability is well reproduced by the model (Fig. 1b), despite this bias. In contrast, nitrate and phosphate seasonal variability remains low (not shown). Figure 3(a, b, c) Annual mean surface chlorophyll concentrations (in mg Chl m−3) from (a) GLOBCOLOUR data (b) TRI simulation and (c) TRI_imp simulation. Panel (d) shows the annual mean surface chlorophyll concentrations of Trichodesmium in the TRI simulation. Another important feature that needs to be properly reproduced by the model is the iron distribution in the upper ocean. We have sampled the modelled values at the same time and same location as the data. The median value, as well as the dispersion of the iron surface concentrations over the tropical Pacific, are displayed for both the data and the model in Fig. 2a. The Mann–Whitney test reveals that these two normalized distributions are not significantly different (p value = 0.26). Figure 2b, c display the observed iron field and the modelled values, respectively. The best sampled area is the central Pacific Ocean where simulated iron concentrations are low (0.1 to 0.3 nmol Fe L−1, Fig. 2c), which is consistent with the observations (Fig. 2b). The southwest Pacific is characterized by relatively high surface iron concentrations, between 0.4 and 0.8 nmol Fe L−1, both in the data and in the model. Large scale patterns are thus well represented by the model. 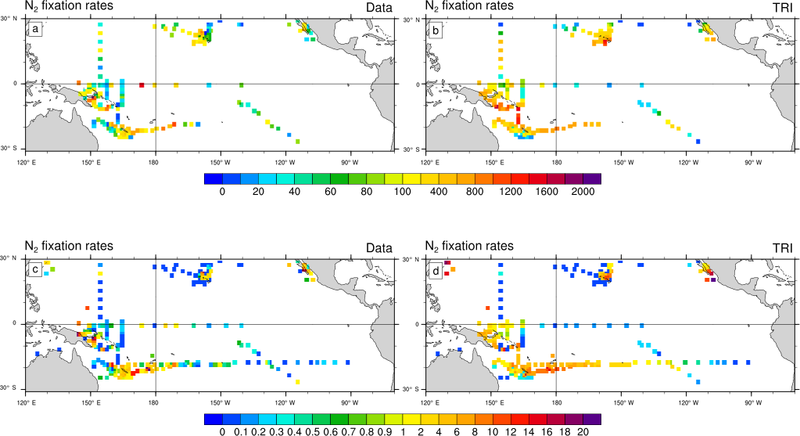 Nevertheless, the model tends to overestimate iron levels in the South Pacific Gyre, between 180 and 140∘ W at about 20∘ S.
Figure 4N2 fixation rates (µmol N m−2 d−1) as observed (a, c) and as simulated by TRI simulation (b, d). In panels (a) and (b), N2 fixation rates have been integrated over the top 150 m of the ocean. In panels (c) and (d), the vertical integration has been restricted to the top 30 m of the ocean. Model values have been sampled at the same location, the same month (climatological month vs. real month), and the same depth as the data. Figure 3 displays a comparison between surface chlorophyll (Chl) concentrations from GLOBCOLOUR data (a), from TRI (b), and TRI_imp (c) simulations. High chlorophyll concentrations are found in the eastern equatorial Pacific upwelling and along Peru in both the observations and our two simulations, with mean values higher than 0.3 mg Chl m−3. However, the equatorial chlorophyll maximum simulated by the model (Fig. 3b, c) is too narrow compared to the observations, especially in the Northern Hemisphere. Similarly, the model is unable to simulate the elevated chlorophyll levels around the Costa Rica dome and the localized enhanced chlorophyll off Papua New Guinea. In TRI (Fig. 3b), chlorophyll values in the southwest Pacific region vary between 0.1 and 0.2 mg Chl m−3, with maxima located in the vicinity of the Fiji and Vanuatu islands. These values are within the range of the data, even if the data tend to be slightly higher (up to 0.3 mg Chl m−3 near the coasts). The spatial structure is well represented, with maxima simulated around the islands. In the subtropical gyres, the simulation predicts chlorophyll concentrations of ∼0.05 mg Chl m−3 which are higher than in the observations (<0.025 mg Chl m−3). In contrast to TRI_imp (Fig. 3c), chlorophyll values in the southwest Pacific and in the Northern Hemisphere are too low in comparison with the ocean colour data (Fig. 3a). Part of the surface chlorophyll in Fig. 3b is associated with Trichodesmium. Figure 3d shows the annual mean spatial distribution of surface Trichodesmium chlorophyll in the TRI simulation. This distribution displays two zonal tongues in the tropics, one in each hemisphere. Maximum values are located in the southwest Pacific (around Vanuatu archipelago, New Caledonia, Fiji, and Papua New Guinea) and around Hawaii, where they reach 0.06 mg Chl m−3. In the South Pacific, high chlorophyll biomass extends eastward until 130∘ W. Further east, concentrations drop to below 0.02 mg Chl m−3. It is important to note that, in the observations, Trichodesmium have never been observed eastward of 170∘ W. This bias in the model could be explained by the overestimated iron concentrations in the South Pacific Gyre. In the Northern Hemisphere, between the coasts of the Philippines (120∘ E) and Hawaii (140∘ W), Trichodesmium chlorophyll concentrations are greater than 0.03 mg Chl m−3. In the northeast Pacific, Trichodesmium chlorophyll is lower, yet significant (<0.03 mg Chl m−3). Otherwise the equatorial Pacific and southeast Pacific oceans are overall poor in Trichodesmium. In Fig. 4, the dinitrogen fixation rates predicted by the model in TRI are compared to the observations from the MAREDAT expanded database. Evaluation of the model behaviour remains quite challenging because of the scarcity of the observations. Some large areas are not properly sampled such as the northwest tropical Pacific and the eastern Pacific. In addition, some areas are sampled only in the surface layer (0–30 m), while others have been sampled deeper. This non-homogeneous sampling may alter the distribution of the N2 fixation rates and undermine the comparison with model outputs. To overcome this sampling bias we compared the observations with N2 fixation rates simulated and integrated over two different layers (0–30 and 0–150 m). Despite their scarcity, some regional patterns emerge from the observations. Maximum fixation rates (600 to 1600 µmol N m−2 d−1; Fig. 4a) are observed around the southwest Pacific islands, in the Solomon Sea, around the Melanesian archipelagos, and around Hawaii, four well-known “hotspots” of N2 fixation (Berthelot et al., 2015b, 2017; Bonnet et al., 2009, 2017; Böttjer et al., 2017). The modelled regional patterns of strong fixation are coherent with the observations (Fig. 4b), showing values in the same range. In the South Pacific, the TRI simulation is able to reproduce the strong east–west increasing gradient of N2 fixation (Shiozaki et al., 2014; Bonnet et al., 2018; Fig. 4c, d). 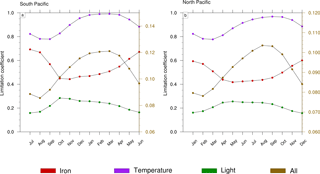 In the equatorial central Pacific, modelled values of mean fixation are negligible (<0.5 µmol N m−2 d−1) in contrast to the observations which suggest low but non-negligible fixation rates (between 1 and 2 µmol N m−2 d−1) (Bonnet et al., 2009; Halm et al., 2012). On the whole modelled domain, and for both integration layers, dinitrogen fixation rates are overestimated by 70 % in TRI compared to the data. Some recent studies have shown that the 15N2 tracer addition method (Montoya et al., 2004) used in most studies reported in the MAREDAT database may underestimate N2 fixation rates due to an incomplete equilibration of the 15N2 tracer in the incubation bottles. Thus, this overestimation may be an artifact arising from methodological issues (Großkopf et al., 2012; Mohr et al., 2010). However, some other studies performed in the South Pacific (Bonnet et al., 2016b; Shiozaki et al., 2015) compared the two methods, and did not find any significant differences. Figure 5Relative contribution (in percentage) of Trichodesmium to total primary production. Figure 6Trichodesmium biomass (mmol C m−2) in (a) austral summer and (b) austral winter, integrated over the top 100 m of the ocean. We evaluated the direct relative contribution of Trichodesmium to primary production (PP; Fig. 5). The spatial distribution of this contribution is very similar to the spatial distribution of Trichodesmium chlorophyll, with two distinct tongues located on each side of the Equator in the tropical domain. In the Northern Hemisphere, the tongue extends from the coast of the Philippines (120∘ E) to Hawaii (140∘ W) longitudinally and between 10 and 25∘ N latitudinally. The maximum contribution (35 %) is reached near Hawaii while in the rest of the tongue, values are close to 20 %. In the Southern Hemisphere, the region of elevated contribution extends from PNG (140∘ E) to about the centre of the South Pacific subtropical gyre at 130∘ W, and between 5 and 25∘ S latitudinally. Maximum values are predicted in the vicinity of Vanuatu and Fiji Islands, where they can reach 35 %. Part of this elevated contribution is explained by the very low PP rates simulated in this region for both nanophytoplankton and diatoms (less than 0.03 mol C m−3 yr−1). Furthermore, the island effect seems to represent an important factor for explaining the spatial distribution of Trichodesmium growth rates. Indeed, maximum Trichodesmium chlorophyll concentrations and the largest contribution of Trichodesmium to PP are achieved near the islands. Finally, in LNLC regions (red boxes; Fig. 1c, d), we assess that Trichodesmium contribute to 15 % of total PP, which is in accordance with biogeochemical studies performed in these areas (Bonnet et al., 2015; Berthelot et al., 2017; Caffin et al., 2018). Figure 7(a) Depth-integrated (0 to 125 m) rates of N2 fixation (µmol N m−2 d−1) at ALOHA for the data (blue) and TRI simulation (red). (b) Depth-integrated (from 0 to 150 m) rates of N2 fixation (µmol N m−2 d−1) in the South Pacific (red box, Fig. 1c) in the data (blue) and in the TRI simulation (red). The blue curve is the average of all the model points inside the South Pacific zone (red box, Fig. 1c), whereas the green curve corresponds to the average of the model points where data are available. Trichodesmium biomass (Fig. 6) and simulated dinitrogen fixation rates (Fig. 7) display a seasonal variability that is driven by the seasonal variability of the environmental conditions (light, temperature, currents, nutrients). The regional maxima of Trichodesmium biomass (exceeding 3 mmol C m−2; integrated over the top 100 m of the ocean) are found in both hemispheres during the summer season (Fig. 6a, b) even if locally, maxima can be attained during other periods of the year than summer. In the South Pacific, the area of elevated Trichodesmium biomass moves by 3∘ southward from austral winter to austral summer. Along Australia and in the Coral Sea, Trichodesmium biomass exhibits a large seasonal variability with a very low winter biomass that contrasts with elevated values in summer. A similar important variability, which is shifted by 6 months, is simulated in the Northern Hemisphere in the Micronesia region and in the Philippine Sea. Unfortunately, due to the scarcity of N2 fixation data, this seasonal cycle cannot be properly assessed at the scale of the tropical Pacific Ocean. This is only feasible at the time series station ALOHA located in the North Pacific Gyre at 22∘45′N, 158∘ W, where seasonal data of dinitrogen fixation are available from 2005 to 2012 (Böttjer et al., 2017). They proved that vertically integrated dinitrogen fixation rates are statistically significantly (one-way ANOVA, p<0.01) lower from November to March (less than 200 µmol N m−2 d−1) than from April to October (about 263 ± 147 µmol N m−2 d−1) as highlighted in Fig. 7a (blue dots). In the model (red dots; Fig. 7a), the maximum amplitude of the seasonal cycle appears to be underestimated relative to the observations (i.e. respectively ∼170 and ∼250 µmol N m−2 d−1). Dinitrogen fixation peaks 1 month earlier in the model than in the data (August for the model and September for the data). Indeed, the simulated dinitrogen fixation rates are minimum between December and May (averaging ∼241 ± 27 µmol N m−2 d−1) and maximum the rest of the year (averaging ∼347 ± 52 µmol N m−2 d−1). These values are comparable to the data even if they are slightly higher. Figure 8Seasonal cycle of the limitation terms of Trichodesmium production in (a) the South Pacific and (b) the North Pacific. The right scale (in brown) represents the total limitation. 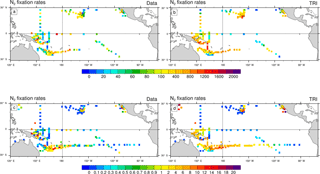 In order to assess the seasonal cycle of N2 fixation rates in the South Pacific (red box Fig. 1c; 160–230∘ E, 25–14∘ S), we have extracted the available data for each month from our database (blue dots; Fig. 7b), and the corresponding model values in TRI (red dots; Fig. 7b). In July no observations are available and in January, April, and August only one data point is available for the entire region. The predicted seasonal cycle is broadly consistent with the observations. Minimum dinitrogen fixation rates (239±205 µmol N m−2 d−1) occur during austral winter and autumn. Maximum rates are reached in February and March, where they exceed 600 µmol N m−2 d−1 in the observations. The increase in dinitrogen fixation rates occurs 1 month earlier than in the observations, in December instead of January, and remains 2 to 3 fold higher from April to June. It is important to note here that the sampling spatial and temporal distribution may distort the seasonal cycle. Using the model, it is possible to evaluate how well the seasonal cycle is captured by the sampling (red dots compared to green dots; Fig. 7b). The general structure of the seasonal cycle remains relatively unaltered. However, the amplitude is significantly impacted since it reaches 1100 µmol N m−2 d−1 if sampled at the observed stations, whereas it is about twice as low at 600 µmol N m−2 d−1 if all the model data points are considered. We can conclude that the TRI simulation reproduces well the seasonal cycle of N2 fixation rates at the Pacific scale, even though more data are needed to improve the evaluation of the model skills. To further investigate the mechanisms that drive the seasonal variability in Trichodesmium in the Pacific, we examined the factors that control Trichodesmium abundance in the TRI simulation (not shown). This decomposition shows that the physical terms (advection and mixing) are negligible compared to biological terms. In addition, the seasonal cycles of grazing and mortality are in phase with the production terms but their sign is opposite. In conclusion, this analysis indicates that this seasonal variability is mainly controlled by the levels of PP, the other terms of tracer evolution dampen its amplitude but do not change its shape. Hence we further examine the limitation terms of PP (Fig. 8) in two representative regions characterized by elevated levels of N2 fixation rates (red boxes; Fig. 1c). A detailed description of these limitation terms is given in Appendix A. A limitation term reaching 1 means that growth is not limited, whereas a limitation term equal to 0 means that growth ceases. Trichodesmium growth sustained by nitrate and ammonia is very slow in LNLC regions due to their very low availability and is therefore not considered further. Thus, our analysis is restricted to dinitrogen fixation. Trichodesmium growth can be limited by iron and phosphate and is inhibited when reactive nitrogen (nitrate and ammonia) is available. In the WTSP, the model suggests that iron is the sole nutrient that modulates Trichodesmium growth (red curve; Fig. 8a, b). The other limiting factors of Trichodesmium growth are light (green curve; Fig. 8a, b) and temperature (purple curve; Fig. 8a, b). The product of these three limiting factors gives the limiting coefficient of dinitrogen fixation (brown curve; Fig. 8a, b). The limiting factors vary according to the season and the hemisphere. In the South (North) Pacific, temperature and light are less limiting during the austral summer (winter) than during the austral winter (summer). The limiting factor associated with temperature varies from 0.8 to 1, and the light limiting factor varies from 0.15 to 0.3. 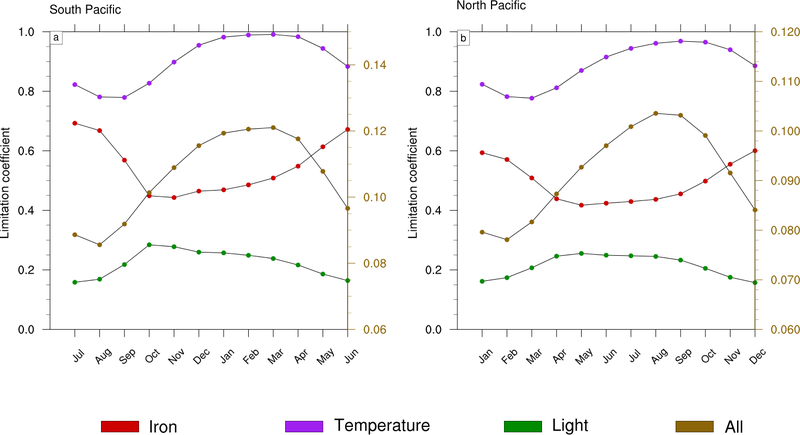 Unlike light and temperature, iron is less (more) limiting in the South (North) Pacific during winter (summer) than during the austral summer (winter) with values varying between 0.4 and 0.7. Finally, Trichodesmium growth is more limited during austral winter (summer) in the South (North) Pacific. The seasonal variability is forced by light and temperature, and iron mitigates its amplitude. Indeed, nutrients and iron inputs brought to the euphotic zone by the seasonally enhanced vertical mixing are counterbalanced by the related inputs (e.g. temperature) of these water masses. Figure 9(a, b) Minimum, mean and maximum in the South box (Fig. 1c) of (a) the iron concentrations (in nmol Fe L−1), and (b) of the chlorophyll concentrations of Trichodesmium (in mg Chl m−3). (c, d, e, f) Annual mean iron concentrations (shading; in nmol Fe L−1) and current velocities (vectors; in m s−1) for (c) the TRI_NoFeSed simulation and (d) the TRI simulation. Annual mean chlorophyll concentrations of Trichodesmium (mg Chl m−3) for (e) the TRI_NoFeSed simulation and (f) the TRI simulation. The concentrations have been averaged over the top 100 m of the ocean. The current velocities are identical on the panels (a) and (b). Monteiro et al. (2011) performed a sensitivity study and found that a 5-fold increase in the solubility of aeolian iron improves the biogeographical distribution of N2 fixation in the southwest Pacific. In the meantime, a recent study has challenged this view by showing no increase in N2 fixation in response to increased dust deposition (Luo et al., 2014). In any cases, the sedimentary and hydrothermal sources were not taken into account in those studies, although they are likely significant sources (Bennett et al., 2008; Johnson et al., 1999; Moore et al., 2004; Tagliabue et al., 2010; Toner et al., 2009). In parallel, Dutkiewicz et al. (2012) evaluated the sensitivity of the biogeographical distribution of N2 fixation to the aeolian source of iron in a model which takes into account the iron sediment supplies, and conclude for minor changes in the southwest Pacific, while in the North Pacific the change was larger. Indeed, there are many islands with a marked orography that could deliver significant amounts of iron to the ocean (Radic et al., 2011) in the southwest Pacific. Figure 10Percentage increase in primary production between the TRI simulation and the Wo_N2 simulation (a, b) and the TRI_imp simulation (c, d); panels (a) and (c) show total primary production including the contribution of Trichodesmium whereas in panels (b) and (d), primary production only includes the contribution of diatoms and nanophytoplankton. To assess the impact of the sediment source of iron on the Trichodesmium production, we used the “TRI_NoFeSed” experiment in which this specific source of iron has been turned off for the islands between 156∘ E and 120∘ W (Table 2). In this simulation, iron and Trichodesmium chlorophyll decrease by 58 and 51 %, respectively (Fig. 9a, b), in the WTSP (red box Fig. 1c). Figure 9c displays the iron distribution simulated in TRI_NoFeSed, and shows that the maxima around the islands disappear. Furthermore, in the South Pacific, iron decreases due to the reduction of the zonal advection of iron downstream of the islands. The iron flux from the sediments around the islands also affects the spatial structure of Trichodesmium chlorophyll (Fig. 9e, f), most noticeably in the South Pacific, with maxima shifted from the South Pacific islands region (e.g. Fiji, New Caledonia, Vanuatu) in the TRI simulation to the coastal regions near Australia and Papua New Guinea in the TRI_NoFeSed simulation. 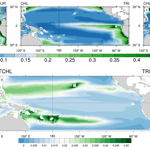 In the Northern Hemisphere, the effects of the sediment flux of iron are less important with a shift of the Trichodesmium chlorophyll maxima towards the Philippine Sea and a localized effect near Hawaii. This sensitivity test demonstrates that Trichodesmium are highly sensitive to the iron distribution in our model and hence that the spatial patterns of Trichodesmium chlorophyll in the southwest Pacific are tightly controlled by the release of iron from the coastal sediments of the Pacific islands. One of the questions we want to address is the quantification of the Trichodesmium impact on PP, at the Pacific scale with a focus on the WTSP region. In the oligotrophic waters of the South Pacific, dinitrogen fixation can be an important source of bio-available nitrogen in the water column through Trichodesmium recycling which can feed other phytoplankton. To evaluate that impact, we calculated the relative increase in PP between the TRI simulation and the Wo_N2 simulation in which no N2 fixation is considered (Fig. 10a). As expected, the spatial structure of the PP differences between both simulations matches the N2 fixation spatial distribution in the TRI simulation (two tongues, one in each hemisphere). In the North Pacific the maximum increase in the PP due to the N2 fixation is located around Hawaii, where it exceeds 120 %. In the remaining part of the Northern Hemisphere tongue, PP increases by 50 to 100 %. In the Southern Hemisphere, values are more homogeneous in the tongue (from 80 to 100 %), even though there is a local maximum around Fiji and Vanuatu (up to 120 %). Out of these northern and southern tongues, the increase in PP is less than 20 %. In average on our domain, the increase in PP is 19 %, and in LNLC regions it reaches approximately 50 %. From total PP only, it is not possible to disentangle the increase in PP directly due to Trichodesmium themselves and the indirect increase due to the impact of N2 fixation on the other phytoplankton groups (nanophytoplankton and diatoms). Indeed, as mentioned in the Methods section, Trichodesmium also releases a fraction of the recently fixed N2 as bio-available nitrogen (in our model Trichodesmium releases ammonia and dissolved organic nitrogen, but only ammonia is directly bio-available). Figure 10b displays the difference in PP due to diatoms and nanophytoplankton only. The main large-scale patterns constituted of the northern and southern tongues persist, but the intensity of the differences contrasts with those found when considering total PP (Fig. 10a). Indeed, the increase in total PP (Fig. 10a) in those two tongues is twice as high as when the direct effect of Trichodesmium is excluded. This analysis stresses the importance of the bio-available nitrogen released by diazotrophs as we attribute about half of the total production increase to this release. Indeed, recent isotopic studies tracing the passage of diazotroph-derived nitrogen into the planktonic food web reveal that part of the recently fixed nitrogen is released to the dissolved pool and quickly taken up (24–48 %) by surrounding planktonic communities (Berthelot et al., 2016; Bonnet et al., 2016b, a). With the simulation TRI_imp, we aim at comparing an implicit N2 fixation formulation to the explicit formulation used in TRI. Figure 10c displays the relative change of total PP between the TRI and the TRI_imp simulations (see Table 2). The implicit formulation displays a similar spatial distribution to that of the explicit distribution but it is predicting a lower total PP, especially in the southern Pacific where explicit formulation leads to an increase of about 45 % in total PP compared to the one related to the implicit formulation. On average across our domain, total PP is about 9 % higher when nitrogen fixation is explicitly modelled relative to an implicit formulation. This difference becomes even weaker (2 %) if only PP by nanophytoplankton and diatoms is considered, with noticeable differences restricted to the areas of maximum N2 fixation in the Southern Hemisphere (around the islands). PP sustained by the release of bio-available nitrogen is thus similar in the TRI and TRI_imp simulations, but an explicit representation of N2 fixation allows for a better description of N2 fixation patterns. Indeed, the areas of intense N2 fixation rates cannot be properly simulated in the vicinity of the islands, especially in the Southern Hemisphere, by the tested implicit parameterization. We also assessed the carbon export (under the euphotic layer, mmol C s−2 d−1; Fig. S1 in the Supplement) and the N2 fixation rate (integrated over the top to 150 m; Fig. S2: panel (a) in µmol N m−2 d−1 and panel (b) in percentage) difference between TRI and TRI_imp simulations. We observe a carbon export greater in the TRI simulation, the average across the Pacific of this difference is 0.1 mmol C m−2 d−1 or 4 %, and in LNLC regions the increase varies between 6 and 10 %. The N2 fixation rates are greater in TRI simulation except in the warm pool, in the equatorial upwelling, and in the Peruvian upwelling. In this study, we simulate N2 fixation through the explicit representation of only one type of diazotrophs, the Trichodesmium sp. This choice has been motivated by evidences that it represents one of the main nitrogen fixers in the western tropical Pacific (Bonnet et al., 2015; Dupouy et al., 2011; Shiozaki et al., 2014) and by the relatively good knowledge (compared to other dinitrogen fixers) we have about its physiology (Ramamurthy and Krishnamurthy, 1967; Ohki et al., 1992; Mulholland and Capone, 2000; Mulholland et al., 2001; Küpper et al., 2008; Rubin et al., 2011; Bergman et al., 2013). However, our model remains simple and some of the mechanisms that drive the behaviour of Trichodesmium have not been implemented in our model. As an example, the ability of Trichodesmium to group in colonies and to vertically migrate (Kromkamp and Walsby, 1992; Villareal and Carpenter, 2003; Bergman et al., 2013) is well documented. The reason for these mechanisms remains unclear, but several hypotheses have been put forward such as avoiding nitrogenase exposition to di-oxygen (Carpenter, 1972; Gallon, 1992; Paerl et al., 1989), or maximizing light (on the surface) and nutrient (at depth) acquisition (Letelier and Karl, 1998; Villareal and Carpenter, 1990; White et al., 2006), or even increasing the efficiency of the uptake of atmospheric iron (Rubin et al., 2011). Our model does not represent those processes nor does it model the resulting vertical migration of Trichodesmium. Moreover, the release of fixed dinitrogen as reactive nitrogen bioavailable to other phytoplanktonic organisms has been set to a constant value of 5 %. This percentage is known to be highly variable and therefore this value is in the lowest range of the observations. An increase in this value would increase the PP due to nanophytoplankton and diatoms in the TRI simulation, and thus decrease the relative contribution of Trichodesmium to total PP, which would be closer to the last observations (Berthelot et al., 2017; Bonnet et al., 2017). Some studies, mostly based on extrapolated in situ data, aimed at assessing the potential of N2 fixation at global or regional scale (Codispoti et al., 2001; Deutsch et al., 2001; Galloway et al., 2004). In the south western tropical Pacific, Bonnet et al. (2017) have estimated total N2 fixation at 15 to 19 Tg N yr−1. For the same region, N2 fixation is predicted to amount to ∼7 Tg N yr−1 in the TRI simulation. As already mentioned, this rather low predicted estimate might be explained by the sole representation of Trichodesmium as nitrogen fixing organisms, which dominate in the western tropical South Pacific (Dupouy et al., 2011; Stenegren et al., 2018). It has to be noted that other diazotroph groups such UCYN-B and DDAs are abundant in the WTSP, representing 10–20 % of the overall diazotroph community (Stenegren et al., 2018). Moreover, the contribution of heterotrophic diazotrophic organisms is poorly studied and may account for a significant fraction of N2 fixation (Moisander et al., 2017). Our model estimation has also been computed from monthly averages and is thus not taking into account the high-frequency variability that may explain at least some of the very high rates of N2 fixation found in the study by Bonnet et al. (2017). Our assessment based on a model could thus be seen as a lower limit for N2 fixation in the western tropical Pacific. Moreover, our model also shows a good qualitative agreement with the studies based on observations that focus on the impact of N2 fixation in tropical oligotrophic waters (Raimbault and Garcia, 2008; Shiozaki et al., 2013). Indeed, in agreement with those studies, our reference simulation predicts that diazotrophs support a significant part of total PP (15 %) in LNLC regions. This study describes the spatial and temporal distribution of Trichodesmium at the scale of the tropical Pacific Ocean, and investigates the impact of a major diazotroph species (e.g. Trichodesmium sp.) on the biogeochemistry of this region. Towards this end, we performed a first 20-year simulation with the coupled 3-D dynamical–biogeochemical model ROMS-PISCES in which we embedded an explicit representation of N2 fixation based on Trichodesmium physiology. This simulation was shown to be able to reproduce the main physical (SST) and biogeochemical (nutrient) conditions of the tropical Pacific Ocean. This includes the spatial distribution of surface chlorophyll and N2 fixation. The validation of this simulation allows us to confidently assess the Trichodesmium distribution. The model predicts that areas favourable to Trichodesmium growth extend from 150∘ E to 120∘ W in the South Pacific, and from 120∘ E to 140∘ W in the North Pacific, with local optimal conditions around the islands (i.e. Hawaii, Fiji, Samoa, New Caledonia, Vanuatu). This broadly corresponds to the LNLC regions where Trichodesmium are predicted to be responsible for 15 % of total primary production (PP). The seasonal variability of the Trichodesmium habitat is dominantly controlled by SST and light, while iron availability modulates the amplitude of the seasonal cycle. In our study we also assess the role played by iron released from the island sediments, and show that this iron source partly controls the spatial structure and the abundance of Trichodesmium in the western tropical South Pacific. However, this region is in the centre of the South Pacific Convergence Zone, which is the largest convective area of the Southern Hemisphere, with rainfall exceeding 6 mm d−1, hence it would be interesting to assess the impact of river iron supply on the diazotroph activity. In addition, the Vanuatu archipelago and Tonga are located on the ring of fire, hence hydrothermal sources could have a strong impact on N2 fixation. These two iron sources are not yet implemented in our configuration but may improve simulations of N2 fixation in the southwestern tropical Pacific region. Finally, our explicit simulation of N2 fixation has proven to be higher by 25 % (while still in the lower end of estimations from observations) than the more commonly used implicit parameterization. where 0.25 d−1 is the maximum observed growth rate (Breitbarth et al., 2007). Hence, at 17 ∘C the growth rate is zero and maximum growth rate is reached at 27 ∘C. The Trichodesmium light limitation is similar to nanophytoplankton (Aumont et al., 2015). From Eq. (2), we distinguish two cases for the growth rate due to N2 fixation. In this equation, the first right-hand side term corresponds to photosynthesis, the second term corresponds to respiration, and the third term estimates nitrate and nitrite reduction. The parameters used in this equation are directly taken from Flynn and Hipkin (1999). The supplement related to this article is available online at: https://doi.org/10.5194/bg-15-4333-2018-supplement. We thank the ship captains, the scientists, and funding agencies of all the projects (OUTPACE, BIOSOPE, MOORSPICE, DIAPALIS, NECTALIS, PANDORA, Mirai) that allowed data collection without which we could not validate our model. The authors thank the Institute of Research for Development for supporting all authors. Cyril Dutheil is funded by European project INTEGRE.